The Middle Years : Top 10: Reason Parents CAN Make Great Leaders! 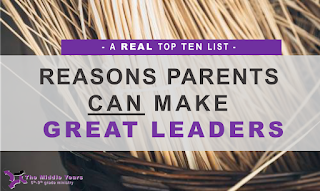 Top 10: Reason Parents CAN Make Great Leaders! Not every parent is a great youth leader and some parents are not called to serving other’s children, but if we dismiss parents outright from our ministry, me miss out on HUGE opportunities, blessings, and some GREAT LEADERS! 10. Maturity- An adult that is a parent CAN be more mature. They CAN be less likely to say something dumb or respond immaturely to a situation. 9. Life Experience- A parent CAN add some great things to your ministry and to conversations and teaching because they have more life experiences. They CAN bring the good and the bad of their past mistakes into a small group time. 8. Relationships with Other Parents- The right parent as a leader CAN be your greatest defender and communicator. You CAN send a parent out of your ministry armed with all the good stuff into their circle of influence with other parents. Parents CAN be more likely to listen to another parents when it comes to your ministry. 7. Time Management- Parents CAN be better managers of time, because they have to be already. While they may have a million things "on their plate", they CAN know how to balance it. 6. Training- Parents CAN come to you already trained. Whether it be from a work setting, another ministry, or some other way. Parent CAN more likely come to you already prepared with the tools to be a great leader. 5. Reliability- Being a parent CAN mean that others are relying on you (*kids, spouse...), so parents CAN be more reliable. They CAN be use to living up to other expectations and being relied on, so when it comes to your ministry they CAN be reliable. 4. Resources- Parents CAN have resources that you don't know about or might have never thought of. They have work connections, local connections, and the inside scoop on all kinds of things. They CAN be a wealth of information and be a go to in finding last minute resources and help. 3. Patience- Parents CAN be patient. Not all parents are patient, but as a parent they have learned the maturity and life skill of being patient with silly actions, dumb questions, and just plain annoying little people. 2. Respect- Parents CAN come to your ministry already pre-loaded with an element of respect. They are a parents, so automatically they CAN get and have respect, even before it is truly earned. 1. WISDOM- Father knows best and Mom always said? Parents CAN bring to your ministry more than knowledge and understanding. They CAN bring to your ministry Wisdom. They CAN bring to their role as a leader Godly insight and discernment.